Welcome to my world of fairies … I have studied the ways of fairies for many years and as well as photographing these little creatures I make fairy figures to look just like the ones around me. 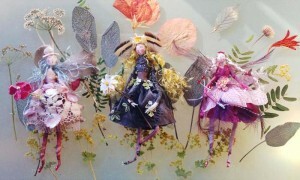 Each figure is a one-off and made with only the finest fairy-like fabrics, often hand dyed with fruits and flowers so the spirit of Nature is imbued in each fairy and to be kept as a keep-sake to be handed down. I make various collections throughout the year, culminating in a sumptuous Christmas collection and extravagant fairies for the top of the tree. Larger fairies come in a Betty Bib labelled box and all fairies come with a name label, often with hand dyed information attached. Personal commissions can also be undertaken … and do look out for my paintings of fairies on greeting cards at Cherry Picked For You cards. Please e mail me on my contact page with any queries . Thanks for calling by and may magic always be with you!